Questa ranked second in a list of the 50 most noteworthy font releases of 2014. It was chosen by a large panel of experts, consisting of John D. Berry, José Scaglione, Bruno Maag, Mark Barrat, Marina Chaccur, Jean-Baptiste Levée, Verena Gerlach, Dan Reynolds, Jacek Mrowczyk, Silvia Sfligiotti, and also from some lists like ‘Our Favorite Typefaces of 2014’ (Stephen Coles), ‘Die Besten Fonts 2014’ (Christoph Koeberlin), ‘The best of 2014’ (FontShop) and ‘The Best Typefaces of 2014’ (Sean Mitchell). The list was published in the 365Typo annual book, as well as in the Polish magazine 2+3D (‘50 Najlepszych krojów 2014 roku’). On September 15th 2014 Questa was released, a type system with serif, sans and display versions, designed by Jos Buivenga and me. We can say that five years after we started making the first sketches, the result is very satisfying. Questa has been released at Fontspring. 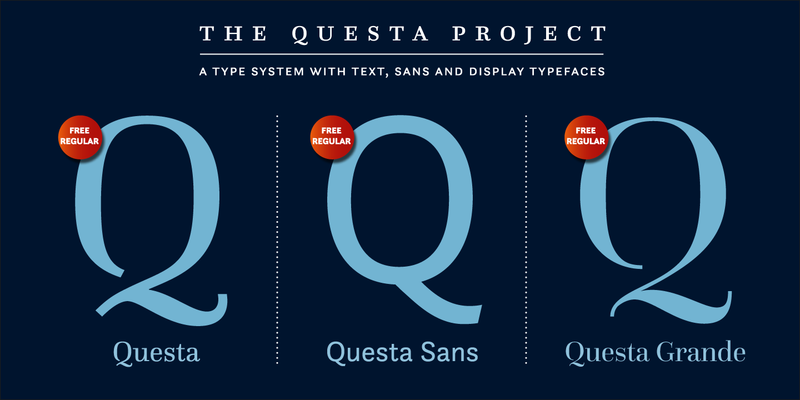 The three regular weights of Questa, Questa Sans and Questa Grande are FREE. It is no secret that I hate Helvetica, especially for the way it came into being (practically copying Akzidenz Grotesk). When André Baldinger invited me on May 18, 2013 to give a lecture at the Zurich University of the Arts (Zürcher Hochschule der Künste) I almost felt going into the the lion's den, or as the german’s say In die Höhle des Löwen. Much to my surprise the swiss students who attended my lecture were absolutely not dogmatic. I had expected they were advocating Helvetica by fire and sword, but luckily my fear was not justified. I told the students that I am working with Jos Buivenga on Questa, a didot-like typeface that will also feature a sans serif version in the spirit of Akzidenz Grotesk. The above image tries to explain that we are not following the path of copying Akzidenz (like in Helvetica has been done), but rather create an original sans that is based on an original serif typeface. 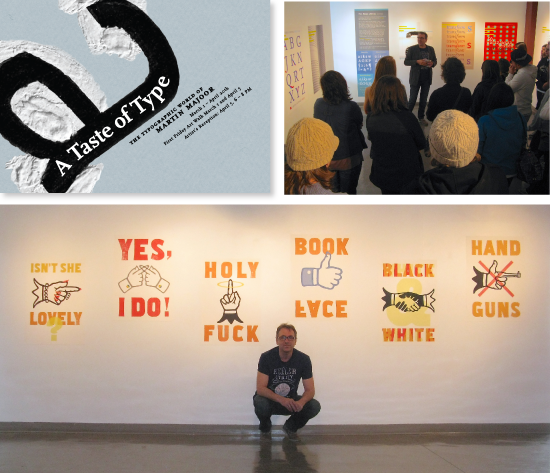 A Taste of Type – The typographic world of Martin Majoor, my ﬁrst solo show in the US, was hosted by Brick City Gallery (part of Missouri State University) in Springfield. The show contained large size colour prints of sketches and type specimen of my typefaces Scala, Telefont, Seria and Nexus. Especially for this show I produced nine posters, combining wood type with different ‘hands’ from my Scala typeface. Jacek Fraczak, a professor at the university’s Department of Art + Design and the driving force behind my ten-day stay, also invited me for lecturing and for a three-day workshop on type design. During my stay I had the pleasure of meeting Douglas Wilson, the director of Linotype: The Film, a great documentary film about the Linotype type casting machine (that according to Thomas Edison was the ‘Eighth Wonder of the World’). Nijmegen is the oldest city in The Netherlands, situated about 20 km from my hometown Arnhem. There has always been a certain rivalry between the two cities, not only between the local football clubs, but generally between the north (Arnhem) and south (Nijmegen). 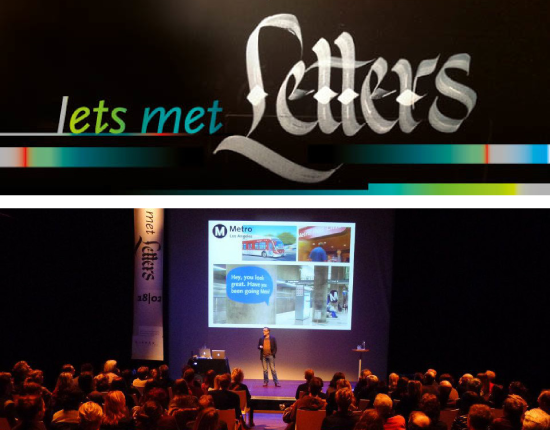 Despite this rivalry on February 18 I was kindly invited to give a talk about my type work. The lecture took place at LUX, a complex of cinema, theater and concert hall that was opened in the year 2000 by Catherina Deneuve. At the time it was Europe’s largest arthouse. During the evening, that was called ‘Iets met Letters’ (‘Something with Type’), there were two other lectures: Job Wouters and Gijs Frieling talked and demonstrated their work for Belgian fashion designer Dries van Noten; in another lecture Bas Jacobs (from the ‘pan-European design collective’ Underware) lectured about their blackletter Fakir. The long evening was more than sold out, I really felt at home in Nijmegen and I almost missed the last train back to Arnhem. 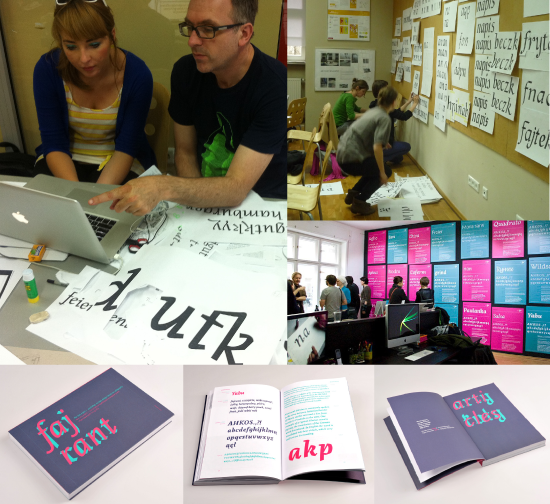 After the succesful type design workshop ‘Ala ma font(a)’ – Typefaces for kids! in 2011, the Academy of Fine Arts in Katowice organized a second workshop called ‘Ala has a pen – workshop type design based on calligraphy’. The workshop was spread over a period of 9 months with 6 sessions of 2 days each. Teachers were Filip Blažek, Verena Gerlach, Sarah Lazarevic, Marian Misiak and myself. The students were introduced to the world of the broken script (‘Fraktur’ in German) using real steel pens and ink; the ‘double pencil method’ was used to show the basics of the humanistic italic; a totally different world of writing was explained, that of the Arabic script; the students were given insight in calligraphic swash skills. And all this was done without using digital media. Only at a later stage the resulting type designs were put into the computer. On Friday 14th December 2012 the results of the workshop were exhibited in the main hall of the Academy. The accompanying book ‘fajrant’, designed by Zosia Oslislo, was presented during the opening of the exhibition. In the book 20 selected students were given four pages each to show their typeface, also all teachers had contributed texts on writing. The book was a tremendous achievement considering the little time and resources that were available. Especially for this book Berlin-based type designer Verena Gerlach designed a few characters of what she calls ‘Scala Fraktur’. Update Januari 2013: For the book, designer Zosia Oslislo was awarded a Certificate of Typographic Excellence from Type Directors Club, New York. Update May 2013: From April 8 untill May 5, 2013 the exhibition of ‘fajrant’ moved to Berlin, to the gallery of Mota Italic. Update June 2013: In Poland the book was awarded Most Beautiful Book of the Year 2012 at the 53rd Competition of Polish Association of Book Publishers. Since May 2012 my website is set in my own typefaces (FF Nexus, FF Seria Italic, FF Scala Sans Condensed). All my typefaces are now available as Webfonts. Webfonts are compatible with Typekit, a service that has a partnership with FontShop. Essentially Typekit is an easy way to use high-quality Open Type fonts on the web. Many thanks to FontShop’s Christoph Koeberlin who helped me implementing and testing the fonts on different platforms (Mac, Windows, Linux). I especially love to see it on my iPhone retina display. 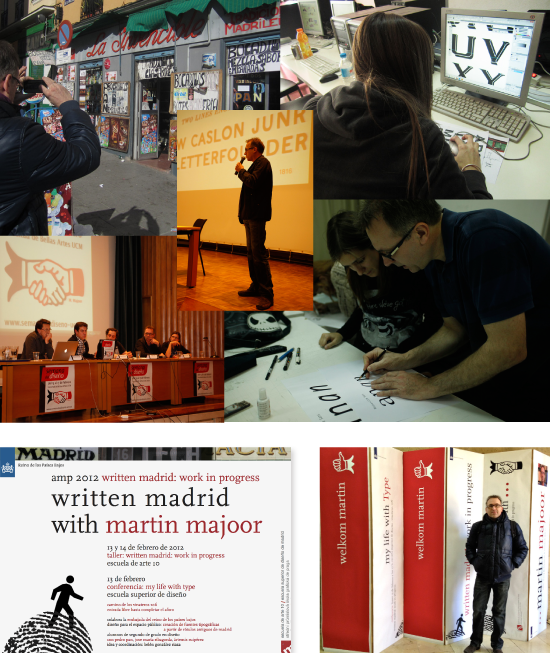 In a cold week in February 2012 I was invited to Madrid for leading workshops and giving lectures at two different design schools. The first workshop ‘Written Madrid’ was based on already existing letterwork by the students of Escuela de Arte 10 (Escuela Superior de Diseño de Madrid). The students had been taking pictures of street signs and lettering in order to make a font out of it. In Madrid there is a mixture of very old lettering and modernist lettering from the 1930’s (and unfortunatley Arial is taking over sometimes, a real nightmare). The second event I took part was a seminar called ‘Semana del Diseño’ at Facultad de Bellas Artes in the Universidad Complutense. 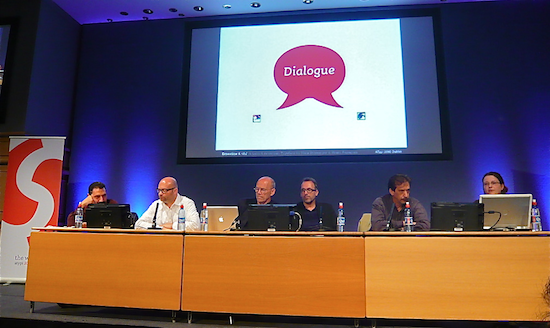 I contributed with a lecture, a panel discussion about typography and with a workshop that was called ‘Designing a sans serif in two days’. After the seminar it was time to explore Madrid. Belén González Riaza, the organizer of the seminar, showed me the best places of the city. One of the highlights was my visit to the National Library of Spain, being shown around by José María Ribagorda, the author of the book ‘Imprenta Real – Fonts of Spanish Typography’ (awarded gold at the European Design Awards 2010). I had the great privilege to see some very old and rare treasures of Spanish printing. In the end of my stay José Ramón Penela interviewed me for the Spanish website on typography ‘unostiposduros’. In 2011 the Academy of Fine Arts in Katowice organized a long typography workshop called ‘Ala ma font(a)’ – Typefaces for kids! Starting point was to design a typeface for children’s books. The workshop was spread over a period of 9 months with 6 sessions of 2 days. One of the basic tools the students used in creating ones own typeface was a self-made broad-nibbed ‘pen’. This tool is a system of two pencils and an eraser, held together by two elastic bands. When writing characters with these two pencils, a sort of outline character appears, which is filled in with black, thus creating a beginning of a typeface design. It is also known as the ‘double pencil method’. Although all 15 students in the end had designed a typeface, only a few of them had sticked to the children’s theme. 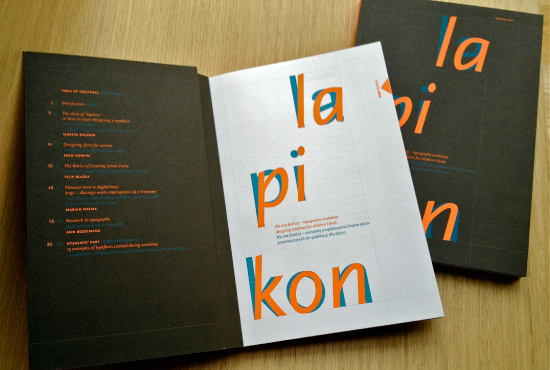 The amazing results were published in the book lapikon (designed by Zosia Oslislo, see image above). All students wrote a short text about their type design and each font is presented in a two page type specimen. There were five teachers involved and they all wrote a text about their input into the workshop: ‘Research in typography (Anne Bessemans), ‘The basics of creating smart fonts’ (Filip Blažek), ‘How to start designing a typeface’ (Martin Majoor), ‘Why it is worth to be friends with the curves’ (Marian Misiak) and ‘Designing fonts for screens’ (Eben Sorkin). 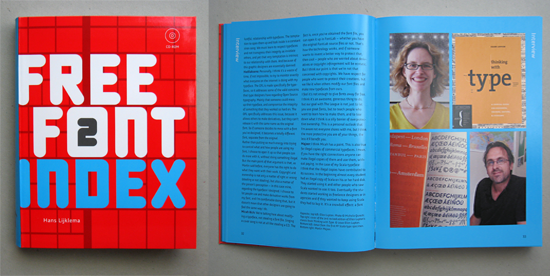 You can have a look at the book online here: lapikon – Typefaces for kids! At the moment a second workshop is taking place, called ‘Ala has a pen’. The stress is even more on writing and calligraphy. Teachers are Filip Blažek, Verena Gerlach, Sarah Lazarevic, Radana Lencova, Martin Majoor and Marian Misiak. Jos Buivenga and I were very proud our Questa typeface was choosen to take part in the major international exhibition ‘Graphic Design: Now in Production’, the largest American museum exhibition of its kind since 1996. Ellen Lupton, one of the lead curators of the exhibition, invited us to show the Questa family, a perfect subject since we are still working on it. The exhibition and the catalogue explore “how graphic design has broadened its reach dramatically over the past decade, expanding from a specialized profession to a widely deployed tool. Featuring work produced since 2000 in the most vital sectors of communication design, ‘Graphic Design: Now in Production’ showcases a series of developments over the past decade, including the renaissance in digital typeface design”. In October 2011 the FF Nexus family was made available as Webfont. Webfonts are compatible with Typekit, a service that has a partnership with FontShop. Essentially Typekit is an easy way to use high-quality Open Type fonts (like the Nexus family) on the web. For this occasion FF Nexus has been revised, mainly for the italic swashes in the Stylistic Sets. 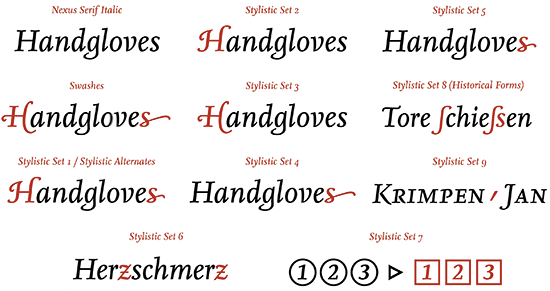 The overview above illustrates what the different Stylistic Sets will do (there are two different Swash capitals and there is a short and a long lowercase end character). FontFont technician Christoph Koeberlin made this instructive video of how to get access to the swashes. There is now also a special Stylistic Set for the Jan van Krimpen comma (SS09). 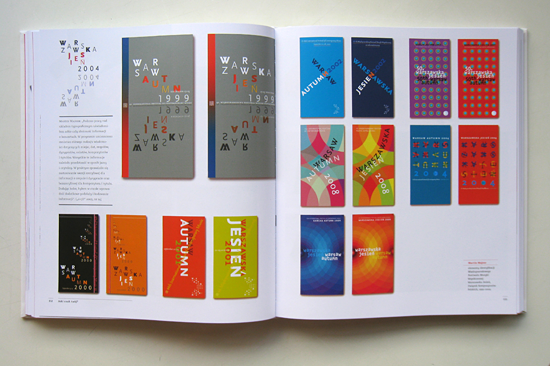 Hans Lijklema, my dutch colleague and friend in Warsaw, has again compiled, written and designed a great book on graphic design. This time it is the second book in the series ‘Pictographic Index’ (published by The Pepin Press in Amsterdam). He is also responsible for the highly successful series ‘Free Font Index’, of which the second volume was published in 2010. 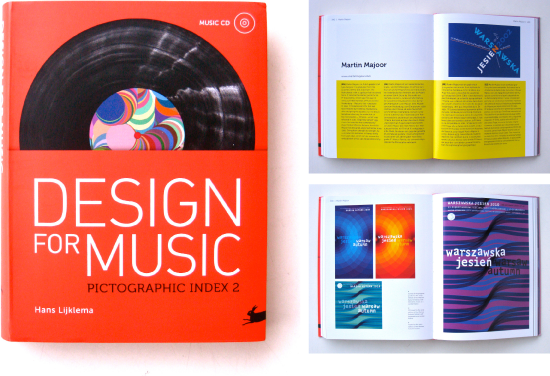 ‘Pictographic Index 2: Design for Music’ shows a selection of music-related designs and illustrations by 25 designers from around the world. Some of the featured designers are also musician, or have their own record label. 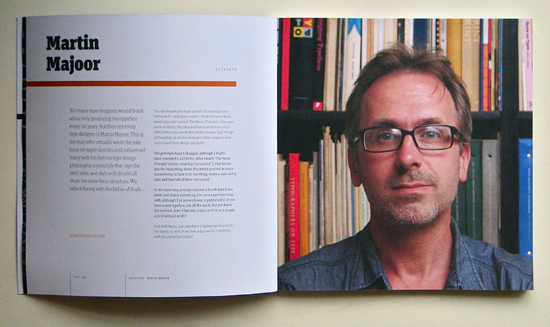 The book contains interviews with a number of artists – including Rudy VanderLans, Jorge Alderete, Rian Hughes, Invisible Creature and Martin Andersen – about their work and their relationship to music. A free audio CD is included with 12 tracks by artists featured in the book. Lijklema did not forget to include a few designs for classical music, one of them being my work for the Warsaw Autumn Festival, the oldest European contemporary classical music festival. I was the festival’s graphic designer for 11 years, up until 2010. 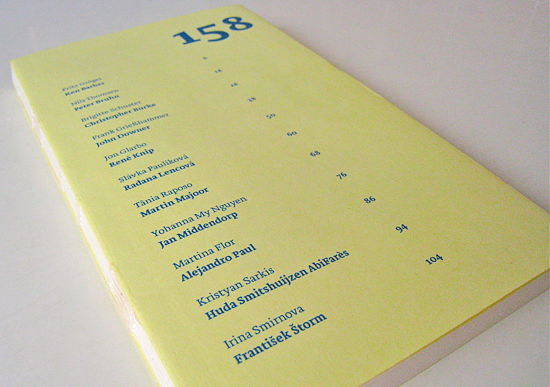 Edited and designed by Hans Lijklema, Written and compiled by Karolina & Hans Lijklema. Lettermix / Which character do you see? .From 25th untill 28th of May 2011 the Centre of Contemporary Art (CoCA) in Toruń, Poland, for the second time organized PLASTER – International Festival of Typography and Poster Design. It was a four-day event with lectures, 3 workshops, and exhibitions of Ed Fella, Władysław Pluta and myself. On top of the CoCA building my exhibition ‘LETTERMIX’ was opened, a mix of old and new work covering a period of more than 20 years. The outdoor exhibition space is surrounded by 48 windows, each containing a frame of 70 x 100 cm. Another 35 frames are hanging on a square building in the middle of the terrace. 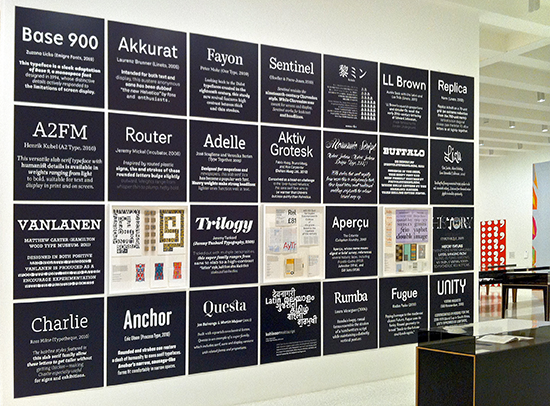 I divided my exhibition into two parts: on the outside there is a chronological history of my type designs FF Scala, Telefont, FF Seria and FF Nexus. The inside building is filled with patterns, each consisting of one character taken from one of my typefaces. ‘Which character do you see?’ could be the subtitle of this especially designed part of the exhibition. The exhibition will be open untill July 24th 2011. Have a look at some pictures of the exhibition here. 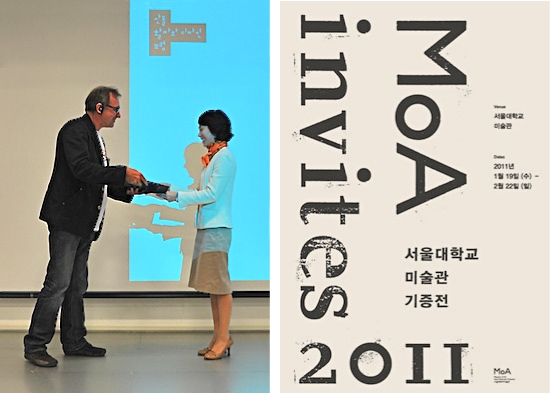 In October 2010 the MoA (Museum of Art Seoul National University) in Korea acquired FF Scala for its permanent collection, the ‘Design and Crafts’ collection. It was the first time the museum made an aquisition of a typeface. Shortly after my lecture in Seoul last October (read this post) I officially handed over FF Scala to Haeng-Ji Kim, the curator of the museum (see left image). The exhibition ‘MoA Invites 2011’ (see the poster on the right) took place from 19 January 2011 untill 2 February 2011, showing all new aquisitions of last year, including FF Scala. One of the nice things is that the museum actually uses FF Scala in its printed matter: the english text in the catalogue is set in it. See some pictures of the beautiful catalogue here. In 1980 Fred Smeijers and I started our studies Graphic Design at the at the School of Fine Arts in Arnhem. During the writing lessons we used broad nibbed pens, but our typography teacher – the late Alexander Verberne (1924-2009) – also showed us sharp pointed steel dip pens. Most of these pens had been manufactured since about 1800 in Birmingham (then the world centre for steel pens) by John Mitchell, A. Sommerville & Cº and Perry & Cº. 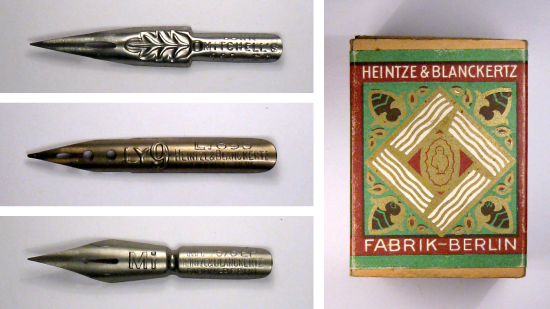 In Germany manufacturers like Heintze & Blanckertz, F.Soennecken and Brause & Cº dominated the market of ‘Stahlfedern’. In Holland there was Gebr.Rikkers who had their pens manufactured in Birmingham (“where steel is king”). Fred and I used the pointed pens for transitional lettering à la George Bickham (the universal penman), and especially Fred was quite skillful in this. But in the 1980s these pointed steel pens – or ‘Schelvispennen’ as we call them in Dutch – were hard to find because most of them were not manufactured anymore. We went to about every office supply shop we came across, also in London and in Berlin. It almost became an obsession but in the end we had collected hundreds of steel pens in all sorts of shapes and sizes. Some pens can still be bought, but I thought it would be nice to share some pictures of the most interesting pens I have. I took the opportunity to change the header of this type blog, using an index nib, the funniest steel pen I posses. Have a look at more pictures of pens and boxes here. Exactely that is what 8 faces is: a real magazine, printed on heavy paper and smelling of intoxicating ink. You don't have to start it up, you just take it in your hands and immediately you can flip through the pages. No need to recharge it after reading the great content. Just put it aside, touch it once in a while, show it to other people or put it vertically on the bookshelf. “If you could use just eight typefaces for the rest of your life, which would you choose?”. That‘s the core questions posed to eight leading designers from the fields of web design, print design, illustration, and of type design. From the eight typefaces I choose, six of them are hot metal typefaces, just because I think its quality is still superior to its digital counterparts. But I also just love the imprint of metal typefaces on paper, it ads yet another dimension to a book. But even without using metal type, 8 faces is a lovely magazine. You will also find interviews with Ale Paul, Stephen Coles, Tim Brown, Nick Sherman, Rich Rutter, Veronika Burian, and José Scaglione. Read all about the magazine here. From 17 to 25 October 2010 I was invited to Seoul for a series of workshops/lectures on typeface design. Highlight of the week was the Type & Design Forum 2010 which took place at the Museum of Art (MoA) of the Seoul National University. My work as type designer was the main focus of the event. Many renowned graphic designers and typographers like Karel Martens, Neville Brody and Armand Mevis had been invited in previous years, but it was the first time a typeface designer was invited. About 9 months ago I was asked by Tânia Raposo – then student at the Type & Media postgraduate course of the Royal Academy of Arts in The Hague (KABK) – to give an interview. It was part of a larger project in which 11 students were asked by their teacher Peter Biľak to conduct an interview with a respected professional whose work was relevant for their personal work, but who is not a teacher at the KABK. The list of the interviewees is quite divers, and the students used all sorts of methods to conduct the interviews: face to face, voice over ip, online chat and email conversation. Ken Barber by Fritz Grögel, Peter Bruhn by Nils Thomsen, Christopher Burke by Brigitte Schuster, John Downer by Frank Grießhammer, René Knip by Jon Glarbo, Radana Lencová by Slávka Pauliková, Martin Majoor by Tânia Raposo, Jan Middendorp by Yohanna Mỹ Nguyễn, Alejandro Paul by Martina Flor, Huda Smitshuijzen AbiFarès by Kristyan Sarkis, František Štorm by Irina Smirnova. All interviews were brought together in a small book of 112 pages. And although ‘158 Answers’ was produced by the students themselves (using a 1200 dpi laserprinter), in all its aspects it has become a nice little book: the choice and diversity of the interviewees, the size, the weight, the paper, the binding with an open spine. The text was set in Brioni designed by Nikola Djurek, himself a postgraduate student at Type & Media in 2005. There is only one minor point of critic: there are only 50 copies... A book like this deserves to be published in a limited edition, maybe through Peter Biľak own small publishing house Typotheque. > More images of ‘158 Answers’ on the website of Tânia Raposo. 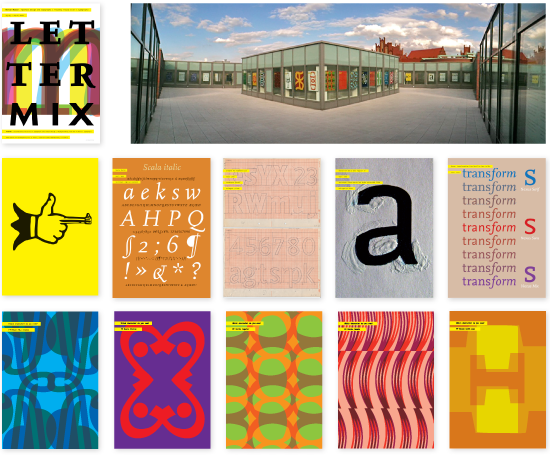 > Visit also the website with type designs by all 11 Type & Media graduates of 2010. Update 1. 10-11-2010: Peter Biľak has confirmed he will indeed publish ‘158 Answers’. Update 2. 10-10-2011: In 2011 ‘158 Answers’ has been published by Typotheque. 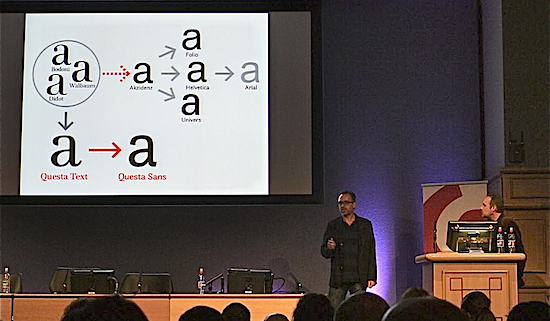 ATypI 2010 – ‘The Word’ – took place from 9 to 12 September 2010 in Dublin, at the historic venue of Dublin Castle. It was my first visit to Ireland and the days I spent at the conference were both interesting and fun. There are four personal highlights I would like to share here. Another event I was involved in was the panel discussion Managing multiplicity - The Pitfalls and Pleasures of Collaborative Typeface Design. The panel members were (from left to right) Hrant Papazian (chair), André Baldinger, Erik Spiekermann, myself, David Berlow and Nina Stössinger. For some type designers collaborating means working together with technical people and clients, whereas I think the real challenges of collaborating are on an artistic level. Usually I don't collaborate in type design, but in the case of Questa Jos and I found a true artistic collaboration. 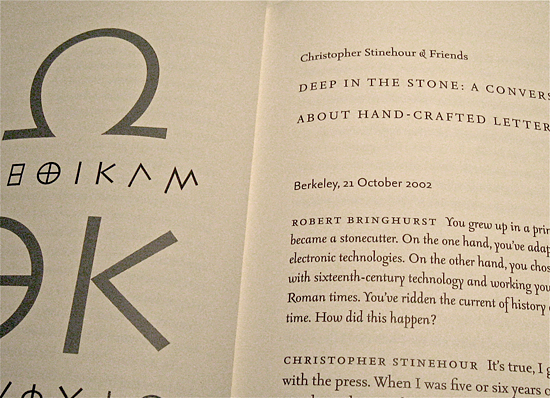 During this ATypI conference I finally got to meet Robert Bringhurst in person. His book ‘The Elements of Typographic Style’ is among my favorite books on typography (and not only because FF Scala Sans is used for the captions throughout the book). In another book ‘Carving the elements: A Companion to the Fragments of Parmenides’ (pictured above) Robert Bringhurst uses my FF Seria and FF Seria Sans in a way I had in mind when I designed it back in 2000. Therefore I consider him not only a great writer, but also a great typographer. Last but not least: I was pleasantly surprised by the fact that this years ATypI program booklet was completely set in FF Scala. The design was done by Clare Bell and Brenda Dermody, cleverly using fluoriscentic red for the captions. I haven’t been to a lot of ATypI conferences, but I presume it is the first time the ATypI program booklet is set in FF Scala. For me it is great to see this, more than 20 years after Scala’s first appearance. Since the end of June, FF Scala and FF Scala Sans are available as Webfonts. Scala Webfonts are compatible with Typekit, a service that has a partnership with FontShop. Essentially Typekit is an easy way to use high-quality Open Type fonts (like the Scala family) on the web. 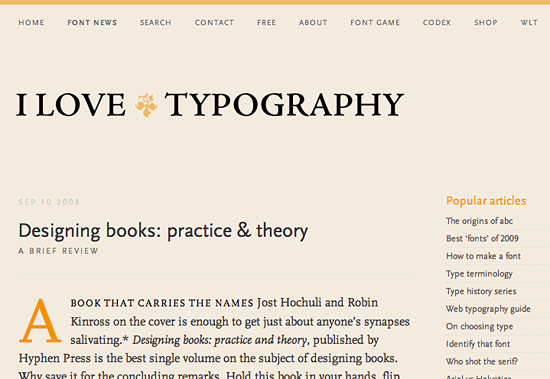 I am very proud that the website of I Love Typography was one of the first to use the Scala webfonts. In my view this site, hosted by John Boardley, is todays best website on typography, and I think the way Scala looks on the web is truly amazing (see image below, or better visit the real site). The technical staff at FontShop sure did a great job on hinting the Scala webfonts. I hope to change my own website soon, and I am sure you can guess which fonts I am going to use. Hans Lijklema is a Dutchman living in Poland, just like me. We regularly meet in the Warsaw coffee shops (not comparable with the Dutch ones) to have a ‘lekker bakkie’ (Dutch for a good cup of coffee). Hans, who is the author of ‘Free Font Index 1’ and ‘Pictographic Index 1’ (both published by The Pepin Press in Amsterdam), has just compiled the second volume of ‘Free Font Index’. 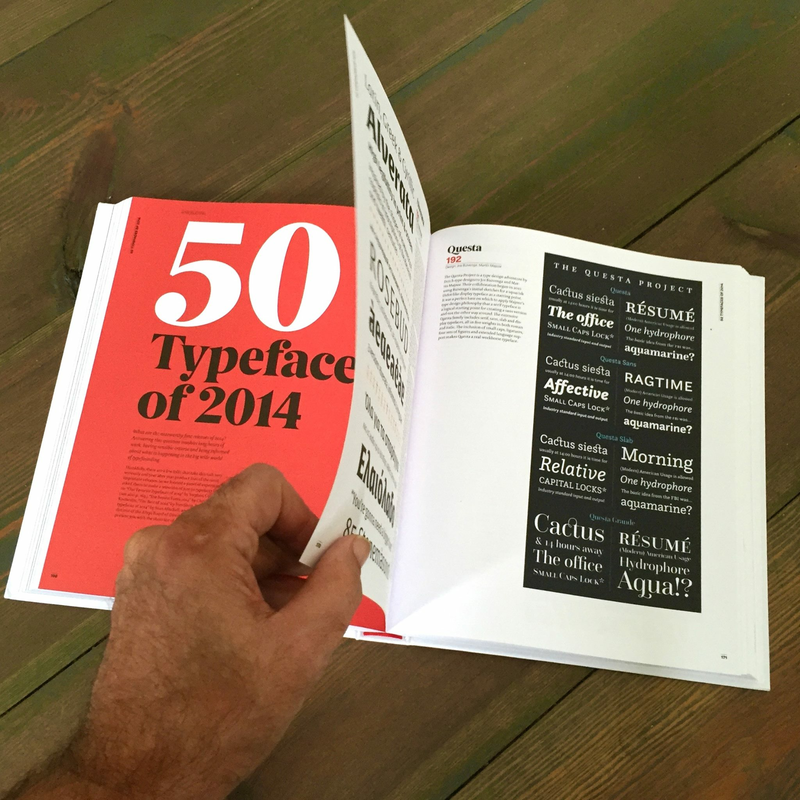 It is a type specimen that contains over 500 fonts by different type foundries. A good part of ‘Free Font Index 2’ (about 50 pages) consists of texts, images and interviews about free fonts, thus making this book much more than a simple collection of free fonts. There are interviews with Donald Beekman (DBXL), Jakob Fisher, Ray Larabie and Svetoslav Simov. Jos Buivenga (exljbris) talks about ‘Serendipity in type design’ and Max Kisman wrote a tutorial on how to design and produce your own font. Ellen Lupton is also present in the book. Hans Lijklema arranged an interview/discussion about free fonts between Ellen Lupton, Caroline Hadilaksono/Micah Rich (The League of Moveable Type) and myself (see the spread on the image above). It is my conviction that you cannot be a good type designer if you are not a book typographer. Since 1999 I am the graphic designer for the Warsaw Autumn Festival in Poland, one of the oldest European music festival that is fully dedicated to contemporary classical music. I designed the inside typography of the programme books which was then a perfect opportunity to use and to test my newly designed Seria and Seria Sans. I also designed colourfull covers for the books. The whole graphic design for the festival is purely typographic, maybe a reaction to the typical illustrative, handlettered Polish posters. Jacek Mrowczyk and Michał Warda (from the Poznań Academy of Fine Arts) have published the book ‘PGR. Projektowanie graficzne w Polsce’ (PGR. Graphic Design in Poland). They present the most interesting examples of Polish graphic design of the last decade, and I am proud they also included the book covers I designed for the Warsaw Autumn Festival. The book is in Polish only. On Friday, May 21, Sébastien Morlighem and I will present the book we wrote about José Mendoza y Almeida (see the post below), during TypoBerlin 2010. José Mendoza y Almeida – the »Godfather« of French Type Design. José Mendoza y Almeida (now 83 years old) designed typefaces like Pascal, Photina and ITC Mendoza. He is considered the “godfather” of french type design and he is still active today since he began working with Roger Excoffon at the Fonderie Olive in 1954. The first ever dedicated book to his work was published last March in Paris by french publisher YpsilonÉditeur, as part of the Bibliothèque typographique collection. It features several essays by Martin Majoor and Sébastien Morlighem, with an introduction by Jan Middendorp. Many unpublished documents are reproduced in the book. In 2009 FontShop announced a series of detailed microsites dedicated to the most important FontFont originals: FF DIN, FF Meta Serif, FF Trixie, FF Dingbats and FF Scala in all their full-featured glory. Go to the Scala microsite here. At the moment I am working on FF Scala Slab, a logical next member of the Scala family. I am planning to release it in the second half of 2010, in the planned versions: light, regular, bold and black. 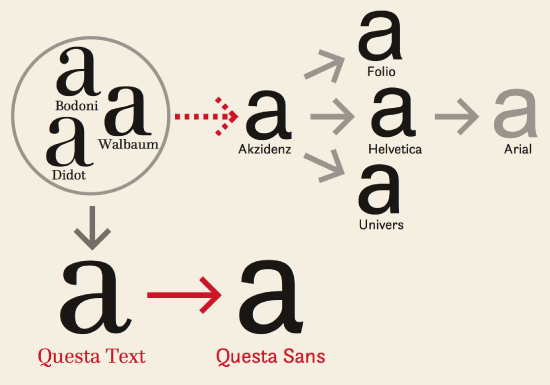 The Questa project is a type project of Jos Buivenga and Martin Majoor. It all began in April 2009 after we had met at the 33pt. Symposium in Dortmund, both giving a lecture. We knew each other from the Academy of Fine Arts in Arnhem, but we had not seen each other for about 25 years. We renewed our contact and after a few meetings we decided that we wanted to do a type design project together. Questa in progress, a squarish Didot-like font that Jos originally had planned in one display style only, was a perfect basis to apply upon Martin’s typedesign philosophy about the form principle of serif and sans, as advanced in an article for Eye Magazine about the origin of the sans serif and Helvetica’s plagiarism. More on the official site of The Questa Project.